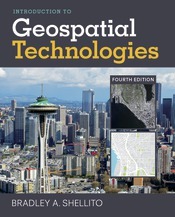 Written for majors and non-majors alike, Introduction to Geospatial Technologies demonstrates the wide range of geographic technologies available to and used by geographers today. Each chapter contains an introduction to the key concepts and a lab activity, so that in addition to gaining a basic foundation of knowledge, students also obtain hands-on experience with the relevant software. This new edition stays current with its rapidly moving field, with coverage and lab activities revised to reflect is the most up-to-date ideas and innovations in GST.